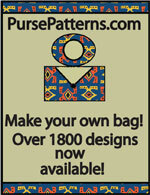 The Backpack Adventures Pattern is a child's (or adults!) 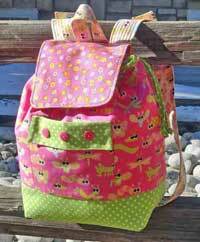 backpack with inside pockets, a drawstring top, and lots of fun detailing! 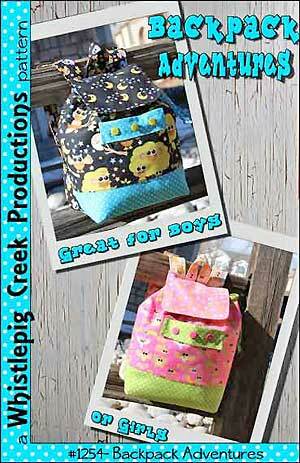 The Backpack Adventures pattern by Whistlepig Creek Productions is the perfect backpack for your child with decorative features and convenient backstraps! 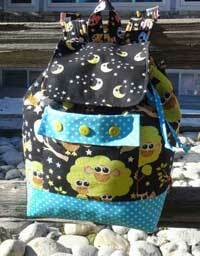 Finished size is 10"W x 13"H x 6"D.
The Backpack Adventures pattern has a total of 8 pages. 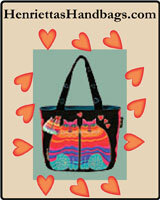 There is a one page cover photo, 1 page of a printing test square, 1 page with a supply list, 4 pages of instructions and illustrations, and a 1 page pattern piece for the flap of this bag.